Apparently, soda isn’t just good with chips and popcorn—you can also use it to give your thin and limp hair texture and volume. In March, model Suki Waterhouse revealed to Us Weekly that she uses Coca-Cola to rinse her hair, because it gives it more character. “I don't like my hair when it's washed—it's fine and limp—but Coca-Cola makes it tousled, like I've gone through the Amazon or something," she said. According to Hair Finder, Coke’s pH level is very low, which means it falls under the classification of an acidic solution. “When applied to the hair, it causes the cuticle of the hair to contract (or tighten) and will make the hair appear smoother and shinier. This also means that the hair (particularly hair prone to curl) will have its natural curl enhanced,” they explained. Pretty cool, huh? 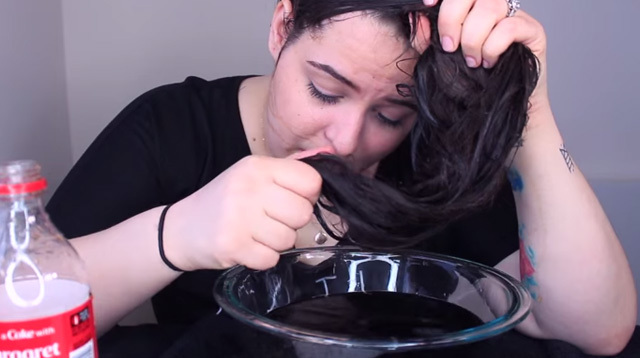 Even with that explanation and hundreds of testimonials about the hair hack online, we’re still not sure we want to try this. Coke, after all, is so acidic that it can get rid of rust on chrome and help unclog a toilet. And given that our scalp is super delicate, we’re not sure it would be the brightest idea to put soda anywhere near it. Sorry, Suki. So if your only concern is creating voluminous curls and beach babe waves, we suggest sticking to conventional means like a sea salt spray or a hair texturizer. Have you tried this hack? Did it work for you? We’d love to know!